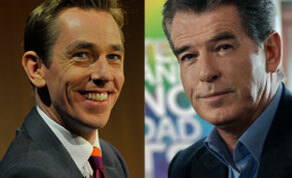 Ryan Tubridy and Pierce Brosnan, the face of Sky Broadband. Sky Broadband has been officially named the new sponsor of ‘The Late Late Show’, replacing Liberty Insurance after the expiration of their four-year sponsorship deal. The unprecedented move sees RTÉ’s flagship programme sponsored by the internet arm of a rival broadcaster - following Sky Broadband’s arrival in Ireland this year, which was supported by a €10m advertising campaign featuring former James Bond Pierce Brosnan. RTÉ welcomed the new sponsorship deal, which is estimated to be worth €1m, as host Ryan Tubridy prepares to lead the show into its 52nd season on Friday 6th September. RTÉ Commercial director Geraldine O’Leary described the deal as a great endorsement of RTÉ’s output - with ‘The Late Late Show’ being the most viewed programme in Ireland last year, averaging 626,000 viewers each week. Sky Ireland’s Managing Director JD Buckley also expressed his enthusiasm towards the announcement today, saying he was pleased that RTÉ and Sky Broadband were entering into a partnership at such an exciting time.